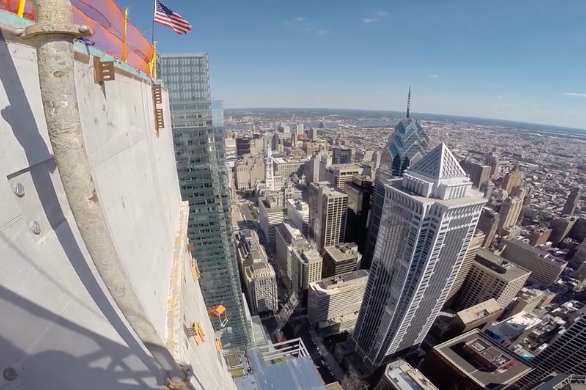 A recently published video shows the view atop the new Comcast Technology Center. You can now see the view from what will be Philadelphia's tallest building before construction is even finished. Engineering and management firm Urban Engineers published the video of the future Comcast Technology Center, found at 1800 Arch St., on its site earlier this week along with a short blog post on the building's progress. The video, which Urban Video Productions put together last month, shows the engineer firm's special inspections group heading up to the 59th floor in a crane basket. The team also stops by the building's 42nd floor which will become a sky garden as well as floors 18 and 19, what the firm is calling the building's "Town Hall." The video takes viewers a total of 891 feet in the air. Once completed, the building will rise 60 feet. Officials cut the building's name from Comcast Technology and Innovation Center to the Comcast Technology Center in mid-November. The Comcast Center stands 58 stories in the air and is found a stone's throw away from the future building at 17th Street and John F. Kennedy Boulevard. The Comcast Technology Center will be completed in 2018. Members of Urban's engineering team are testing the building's welds on the 60th floor, according to its blog post published Monday. "Lifting to the top of the Comcast Technology Center was a thrilling experience," Kaytalin Platt, an Urban Engineers photographer, said in Monday's post. "As a bystander to infrastructure and progress, I've seen buildings raised and lowered around me, but never until that moment, while dangling a thousand feet up, did it ever dawn on me the immense amount of work and complexity that goes into erecting these monolithic structures."